I have been a fitness enthusiast most of my life. As a kid, I did gymnastics at a local recreation center. I remember practicing flips, aerials, and back handsprings in my backyard. At around age 19, I got a job teaching group fitness classes at a small gym in my neighborhood. Not only did I enjoy teaching the classes, but I also loved making a difference in people&apos;s lives by helping them become stronger and healthier. Then I got married and had my first baby. To say that my life changed from that point on is an understatement. By my late twenties, I had three kids, ran a daycare right out of my home, and even taught group fitness classes. I would get up before my kids&apos; days started and teach early morning classes a couple days a week. I really enjoyed it, and it got me to the gym in the mornings. Unfortunately, I had to stop teaching shortly after I became pregnant with my fourth child. Fast-forward about five years later, I had my fifth daughter, just five months away from turning 40 years old. Life had become—to put it lightly—insanely busy with a baby and four other kids, whose ages ranged from 5 to 16 years old, in tow. My days were filled with shuttling them to four different schools, dance classes, gymnastics, soccer, and more. My workouts had gone by the wayside, and by age 43, I unsurprisingly became very out of shape. This was a turning point for me. Not happy with how I was feeling and who I was becoming, I decided I did not want to be "that mom" who didn&apos;t take care of herself and could barely keep up with her kids as they got older. "I never dreamed that some day I would run a marathon, but I ran the LA Marathon in 2012 and 2013, beating my time by 18 minutes." I joined a local boot camp and started my journey back to being fit. In 2007, I got certified in personal training, and started my own personal training business and small group boot camp class. I continued teaching group fitness classes for fun at several gyms in the area because I enjoyed it. During this time, I developed a passion for running. 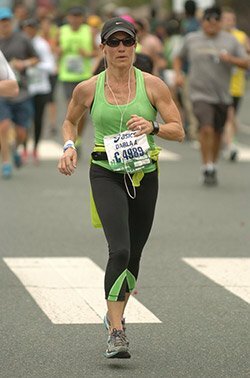 I never dreamed that some day I would run a marathon, but I ran the LA Marathon in 2012 and again in 2013, beating my previous time by 18 minutes. In addition, I had completed a number of short distances races, the Super Spartan race, and about five half marathons—I was pretty hooked on races. Signing up for racing events keeps me motivated, plus I love the challenge and feeling of accomplishment that goes with it. In 2011, my husband bought a building for his chiropractic business, and we added a fitness studio for my own place to train clients. My life is certainly busier than ever, but I now put my health first and make time to workout regardless of how busy I can get. Just last November, I decided to compete in my first ever NPC Figure Competition at age 49. With the encouragement of my husband and a good friend, I got on stage in a bikini and high heels, feeling way out of my comfort zone. The experience opened up a whole new challenge of transforming my body after having five kids and at my age. I ended up winning first place in my class and overall in my age group. Never in my wildest dreams did I imagine I would place, let alone win! I brought home a trophy and the sword that night. Nothing can describe how it felt to accomplish that. It was definitely worth all the hard work! Working out early in the morning is what works best for me. I&apos;m up by 4:30A.M. most days of the week. My show prep workout consists of weight training five days a week and 4-5 days of cardio (yes, even steady-state!). The cardio consists of 2-3 days of HIIT, stadiums, sprints, hill repeats and plyometrics. Eating high quality, fresh and organic food is the cornerstone of my physique. When it came to getting ready for my show, I hired a coach to help me with the diet since I had never competed before. I had 16 weeks to prep for my show, and I limited my carbs quite a bit to lose fat and be stage ready. As I mentioned, I&apos;ve always been into fitness. Getting into bodybuilding was a new challenge for me. I am driven by the change I see in myself when I push beyond my limits and what I think I can do. Not only does it make me stronger physically but mentally as well. I&apos;ve done a lot of fitness-related things in my life, but competing in a figure competition was the most challenging thing I&apos;ve ever done. The thing that is most fascinating about the sport of bodybuilding is the science behind it, the discipline it takes to compete, and the transformation of your body that occurs from beginning to end. When I was a teenager, I remember being called "Herc" (short for Hercules) and teased for having broad shoulders. Inevitably, I felt self-conscious about them. Nowadays, people compliment me on my physique and I&apos;m proud of it. "I am driven by the change I see in myself when I push beyond my limits and what I think I can do." My husband, coaches, family, and friends were my biggest motivators. I could not have done it without their support throughout the entire journey. Seeing my hard work pay off as the weeks went by and visualizing how I would look on competition day also helped me stay motivated. "When I feel unmotivated, I think how blessed I am to be healthy." One major source of inspiration came from a friend of mine who lost her battle to breast cancer about five years ago. When she was undergoing chemotherapy, we would meet at the gym a couple days a week early in the morning to take a group fitness class. Even though she was in pain and her health was failing, she lived life to the fullest. Her positive attitude is something I will never forget. She taught me not to take things for granted. When I feel unmotivated, I think of how blessed I am to be healthy and that I have the ability to move every day. I am fortunate to have a job that I love. It is so rewarding to see my clients reach their goals, become stronger and healthier, and the positive impact such change has on their lives. Knowing that they look to me for inspiration and motivation in turn pushes me, especially on days when I don&apos;t really feel like working out. I practice what I preach. It is my passion to inspire those around me to live a fit, healthy life and go after their dreams. I plan to compete in the NPC Masters Nationals in Pittsburgh in July 2014 to celebrate turning 50. Stay focused, trust the process, and take one day at a time. I hope that my story encourages people of all ages that it&apos;s never too late to go after their dreams. All you have to do is take action. My favorite fitness athlete is Tosca Reno. Her story shows that no matter what age you are or how many kids you have, you can always choose to live fully, with good health and a strong body! I must admit that her clean eating books really helped me on my own fitness journey. Bodybuilding.com has been a great resource for me. I have spent hours on the site, reading about training for a competition, nutrition tips for on and off season, and looking at photos of competitors to see what I need to improve on for the stage&apos;s spotlight! Gina&apos;s outlook on life and fitness keep her built and happy. See how this sizzling bodybuilder gets stage-ready while still enjoying things like rollerblading on the beach!